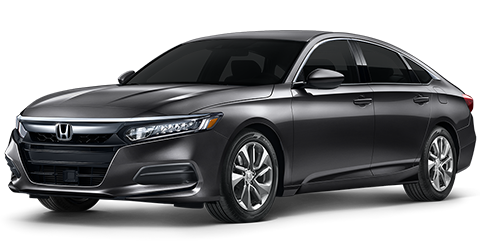 The 2019 Honda Accord is one of the most well-rounded midsize sedans in the marketplace today, and it has been a dominant force, offering innovative features in safety, tech, performance and comfort. If you're in the market for a midsize car, the 2019 Accord might be the vehicle for you. The 2019 Accord brings a fun and versatile package with it wherever you go with several different trims including the standard LX, midrange Sport, EX, and EX-L trims and the top-of-the-line 2019 Accord Touring trim with all of the bells and whistles this vehicle has to offer. To get your first look at a new 2019 Honda Accord for sale, stop into your trusted Lake City car dealership: Honda of Lake City. Everyone knows that the journey is always better than the destination, and this is understood from top to bottom when you step into the interior space of the 2019 Accord. Built to seat up to 5 people in 2 rows comfortably, drivers and passengers will be impressed with the ample leg room in both the front and rear seats, offering even the largest of adults plenty of space and comfort throughout any journeys they endure. Available leather seats throughout the interior space also provide a well-received aesthetic for drivers and passengers alike. The 2019 Honda Accord is well-built with top quality materials and soft-touches across the interior. Beyond the cosmetics of the cabin space, the 2019 Accord also boasts an above-average cargo capacity of 16.7 cubic feet, offering plenty of cargo room for anything you might need to squeeze into this sedan on your many travels. Don't let the smaller car look fool you; this midsize sedan packs a serious punch when it comes to performance under the hood and the thrill it instills in drivers each and every time you get behind the wheel. This powerful ride brings in a 192-horsepower turbocharged 1.5L 4-cylinder engine and a continuously variable automatic transmission (CVT) even in the standard 2019 Accord. For those who like a little more kick in their vehicle, the optional 2.0L 252-horsepower turbo-4 will be more favorable and comes with a 10-speed automatic transmission with it. More impressive than the power this vehicle brings is the amount of efficiency that comes with it. The 2019 Honda Accord boasts an impressive EPA-estimated 30 MPG in the city and 38 MPG on the highway, both of which sit at well above-average for vehicles in its class. The more powerful 2.0L engines and automatic transmission combinations take a slight hit in efficiency, earning EPA estimates of 23/34 MPG city/highway respectively. The 2019 Honda Accord is certainly one of the most versatile cars in the marketplace, but drivers are often surprised at the amount of innovative technologies that exist in this midsize sedan. It's a bold statement to make, but the 2019 Accord might be your most impressive piece of technology while it's sitting right in your driveway. The 2019 Accord comes standard with an infotainment system that acts as the central hub for the entirety of interior tech. This system offers a large 7-inch display screen, Bluetooth® capabilities, and a standard USB port. In select trims, available features include an 8-inch touchscreen display, HD Radio™ and much more. For those with compatible smartphone devices, Apple CarPlay™ and Android Auto™ provide an innovative way to seamlessly connect your smartphone to your 2019 Accord. Both similar in features for their respective operating systems, they are rapidly becoming a must-have feature for vehicles across the landscape. With these features, you are able to access navigation apps, send or receive text messages through voice activation or Siri® and more. The 2019 Honda Accord continues its past successes by offering innovative safety features and technologies to keep driver and passenger safety at the forefront of priorities. It takes much of its structure from the 2018 Honda Accord, which earned a 5-star overall rating from the NHTSA. The 2019 Accord comes standard with a myriad of safety technologies that help protect drivers and their families when the unexpected could occur. 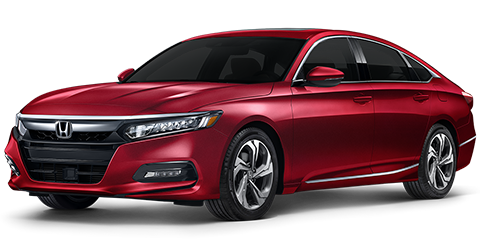 This midsize sedan comes standard with Honda Sensing™ suite of features which includes Collision Mitigation Braking, Forward Collision Warning, Lane-Keep Assist and more. Whether you're a seasoned Honda driver or this is your first experience, you won't need to look any further for a well-rounded vehicle than the 2019 Honda Accord. Stop into Honda of Lake City today to test-drive yours! "MSRP excluding tax, license, registration, $895.00 destination charge and options. Dealers set own prices"